However, we had the wedding to go to, and then when we returned we got sick. Emma was the first; she threw up at 6 am on Monday (we'd gotten home around midnight Sunday) and was feeling poorly all day. Ben got sick around 3 in the afternoon, and when he got sick in bed at midnight, I thought, this is going to be a long night....made longer by the fact that I was getting a sore throat. I woke up on Tuesday feeling horrible--but thankfully the stomach virus was gone. Ben and Emma were back to their old selves and nobody else had it. Which left me with a terrible cold, flu-like aches and almost no voice. I was sick for the rest of that week, so we laid low, canceling all our activities except those on Friday and letting me rest as much as possible. The weekend was busy, and this week was spent getting back into the groove of school work and regular life...and last night I realized that we'd done nothing about a jack o'lantern! When we first has small kids, we used to try to carve the pumpkins two weeks in advance. We wanted to be able to light them every night; what fun was Halloween if we couldn't enjoy the fun of a jack o'lantern? However, unlike when we were kids, October was too warm for carved pumpkins, and inevitably they would end up black and rotted, staved in at one side, with some form of repulsive fly or bug attracted to the rotting flesh. So gradually we shortened the time before carving and Halloween night so the poor pumpkin would stay fresh, eventually settling on 3-4 days before the holiday. We make sure to light it every evening at dusk and let it burn till midnight or so before Matt and I head for bed. I'll post the photos tomorrow. Right now it's late and I'm in no mood. HAPPY HALLOWEEN! This past weekend we traveled to Pennsylvania for the long-awaited wedding of our niece Phoebe. One of the reasons it was long-awaited was that Ben was the ring bearer (Phoebe is his godmother) and Emma one of the two flower girls, and they had been waiting seemingly forever for this event to happen. We left on Thursday morning, and the trip took five hours including one stop and two traffic snarl-ups. It was especially fun because my sister, Amy (Phoebe's mom) and our other niece, Chloe (Phoebe's sister) were here from Vienna and also staying with Phoebe and Andrew. We have seen Chloe a few times since their move, but not Amy--she'd never met Emma and hadn't seen Ben since he was a baby. So it was fun to hang out and talk and get reacquainted, although there was a lot of wedding craziness going on too. Suffice it to say that we had a wonderful time and the wedding went beautifully. Phoebe looked exquisite and much fun was had by all. 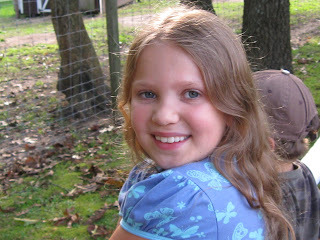 However, since this is my family blog, I will tell two short anecdotes about the ring bearer and the flower girl! Remember how I said the wedding was long-awaited? Well, once we got to Phoebe's, she showed Emma her little basket for the ceremony, complete with silk autumn leaves to toss on the way down the aisle. Silly me, for the past year I'd been telling Emma how flower girls toss flower petals! That went over well! It hadn't occurred to me, but of course it makes sense to throw leaves at an October wedding...so after the initial shock, she made me promise that the next time she was a flower girl, she'd get to throw flower petals!! And now for Ben. Remember that I'd been preparing the kids for their jobs...when Ben realized that the ring bearer pillow had fake rings attached to it, but those were the rings he would use, NOT the real rings, guess what his comment was? "What am I even doing in this wedding, anyway?" However, feathers were smoothed and they ended up doing a terrific job. And Ben went an entire day without wearing his hat, which is the first time since he was around 17 months old that he'd done that. A good time was had by all. And Phoebe and Andrew are on a Carribean holiday, so I'm assuming a good time is still being had by them! 1) Look at the list and put one * by those you have read. 2) Put a % by those you intend to read. 3) Put two ** by the books you LOVE. 4) Put # by the books you HATE. His Dark Materials - Philip Pullman AHA! Finally, I have never even heard of this one! So...I have read 63.5 of the 100 books. Does that make me ten times cooler than the average adult? Or ten times geekier? The huge T. Rex was an awful beast. Upon other dinos he did feast. But in a crime scene he was always found! He walked around eating dino legs. All the dinos hated him so! They shouted, "We want him to go!" "We want him to go and never come back!" "Come on, people, cut us some slack!" But then one day, he disappeared! All the dinos clapped and cheered! All but one that was very wise. She said he might be wearing a disguise. But from that day on, he never came back. And for the other dinos, luck gave them a big whack! Some say he died, and never spoken was his name. Some say volcanoes erupted, and he fell into the fiery flame. for dinos it was fun! His name was never spoken again, and that was not wrong. For to the dinos' great joy, he was gone! Emma and Rachel were chatting about Phoebe and Andrew's wedding in this 25-second long video....We don't have a memory card yet, so the camera won't let us take long videos, or more than 50 pictures...RRRG! I'm a little late posting about this...it seems like every day flies by faster than the last (and I'm afraid my new Facebook obsession doesn't help!) and before I know it another day has gone by without a blog post. Anyway, I didn't want to let it go by without mention, so I'm posting now although the event happened last Sunday. When we moved into this house, Emma got her own room on the first floor, right down the hall from our bedroom. She was still nursing at that time, and her habit was to come into bed with us when she woke in the night. It didn't make sense to have her upstairs, where she might fall on the stairs or at the very least wake her siblings trying to reach us. We told Julia she was next in line for her own room. 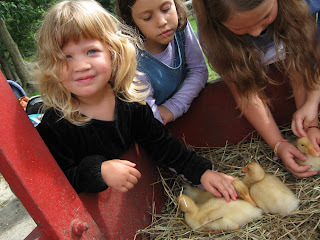 However, when Emma weaned last spring, she had no interest in changing rooms, and we sort of let it go because Julia didn't seem that interested, either. Unfortunately, Emma's habit of coming into our bed in the middle of the night didn't end when nursing did! And as she got bigger, our bed seemed more cramped, till finally Matt was just sleepwalking down to Emma's bed when she'd come in to cuddle. We were really getting tired of not being in the same bed all night! So on Sunday I mentioned switching up the bedrooms. I was met with universal enthusiasm, and so we got right to work--I was taking no chances! Julia, Rachel, Emma and I went to work late in the afternoon on Sunday, after we returned from a family bike ride. It wasn't the best timing, admittedly, but Matt said he'd make dinner and I figured we could always complete the transformation over the week if we had to. Ben helped here and there, but wasn't very invested in the work--I think he ended up in the backyard playing with his light saber at some point. All I did was get the laundry baskets and the Rubbermaid totes we sort laundry into out of the basement, and we began unceremoniously piling toys and books into them. Matt was making noises about dinner being ready, so we took a break. I was feeling pretty good that we'd gotten so much done...I never could have done it without Rachel and Julia's help. I was already planning when I could fit the clothes portion of the festivities in, but then figured I could get started on that after dinner while the kids were bathing and doing the whole nighttime routine. Lo and behold--that part was quite easy since the clothes were just reorganized from summer to winter wardrobes--and I was finished before their bedtime! All that has yet to be done is the careful removal of Julia's handdrawn horse posters from her old wall and the transfer to the new...but that's Matt's job! I know he'll be far more patient and careful than I would be, and Julia is so worried that they'll be torn or ruined that I think it takes his steady hand. Today was a gorgeous day--- bright and sunny, with lower 60-degree weather. Emma was very happy to be able to play outside after a couple days of rainy weather. Being in the house in Fall really gives you Cabin Fever! 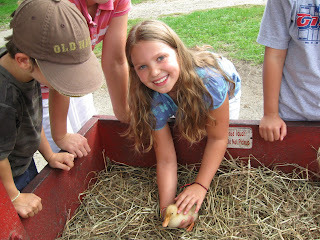 Today we went to the Long Island Game Farm with a group of homeschooling friends. We hadn't been there in years, since Ben was riding in a stroller, so it was nice. It's funny how many things are so close by and yet we don't take advantage of them for years at a time...I guess it's just nice that we have options. Anyway, if you haven't been there, it is a cross between a zoo and a farm (someone who heard me speak of it asked in horror if we were going there to hunt! LOL) There are "wild" animals like giraffes, zebras, cougars, kangaroos, monkeys, coatimundi, lemurs and alligators, but then there are pigs, chickens, ducks, llamas, deer, goats, donkeys, sheep, horses, cows, rabbits and the like. 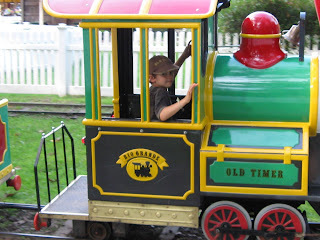 There is also a carousel, a train ride and a tea cup ride, pony rides, a discovery center with shells, antlers, turtles etc. as well as some shows--a big cat show, a talk about alligators, feedings at various exhibits. We headed down a woodland trail from the Discovery Center late in the afternoon and spent some time in front of a huge enclosure with parrots in it--they danced if you sang and tried to imitate noises we made. Then further down we saw some spider monkeys and headed over. I noticed there was a pulley with a cup on it that would go to the top of the enclosure, where a little platform box stuck out in the air. 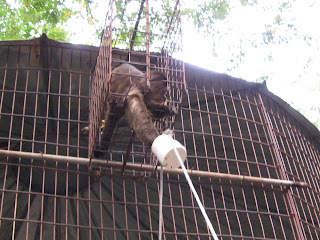 The idea was that the monkeys could get into the box and reach the cup to take out the food. We still had some pellets in our cup, so we tried it. The monkey was excited when he heard the clink in the cup and saw it ascend--but when he saw the pellets, he threw them down in disgust. I guess if I had a hundred people a day try to give me those pellets, I might object too! There was a group already there with two moms, a grandma and several kids. The grandma got excited when she thought the monkey would eat the pellets for us--but when she saw he didn't, she said that they had tried too, and a keeper going by told her they loved grapes. Of course, none of us had grapes. I watched the kids for a bit, calling to and watching the monkeys, and then realized--I'd brought oranges for a snack! Well, it was the cutest thing to see these monkeys eat the oranges! I ended up peeling all five--section by section I doled them out, some for us and some for our furry friends. 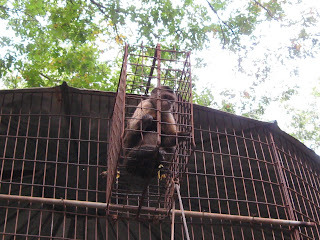 The smaller monkey sat in the platform part of the cage, hooting for the cup to be pulled up. He'd grab the orange out and pick it apart, peeling the pith off and throwing it away just as we do, and breaking each section into two or three pieces to daintily pop into his mouth. I felt sorry for the larger one, who either couldn't or wouldn't fit into the platform, so I experimentally tossed a section towards the cage--and he reached right out and grabbed it through the bars. 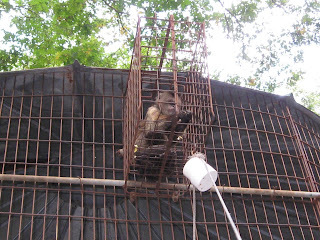 I had a tense moment when a keeper came by and Ben excitedly informed him we were feeding the monkeys oranges-- I thought we might be reprimanded for feeding them unapproved food. But he just said thanks so much--oranges are good for them, and he didn't understand why the farm didn't sell bananas and grapes to feed the monkeys, since they loved them so much....whew! Anyway, we were all disappointed when we had no more fruit to give away, and went on to the alligator show. It was a fun afternoon!